THE Registrar of Voters, Tobaiwa Mudede, yesterday refused to explain his failure to release the electronic copy of the voters’ roll, an issue now at the centre of the July 31 harmonised elections dispute. The MDC–T alleges that the roll was doctored to suit Zanu PF’s interests. According to provisions of the Electoral Act (Section 21), Mudede was obliged to furnish candidates with the hard and electronic copies of the roll “within a reasonable period of time”, but only the hard copy was made available just a day before the polls. At a Press conference held in Harare, Mudede said the electronic version of the roll had become a “contentious” issue, before referring the question to one of his officers. “The time we had was short. What we had to prioritise was the hard copy so that we could send them to the polling stations,” the officer, only identified as Muchira, said. Pressed further on which — between the hard copy and electronic copy — would have been easier and faster to dispatch, the evasive Mudede said he had a right not to answer the question. He accused the MDC–T of coming to collect the voters’ roll late in the day on July 30 following a court ruling to that effect, saying it was a deliberate bid to frustrate him. Mudede accused the MDC–T of double standards and came short of calling them bad losers, arguing that in 2008 they did not accuse him of manipulating the roll because they had bagged a significant number of seats. “All over the world, when people lose, they point fingers. This is a different industry where a lot has to be said. If people win, they don’t talk and if they lose, they talk. It’s part of the game,” he said. 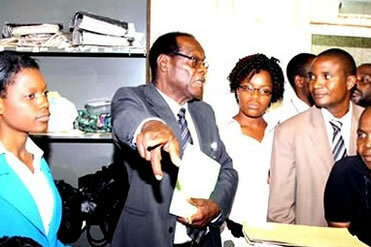 Turning to the Diaspora vote, Mudede said although his office had been registering Zimbabweans living abroad and he had personally gone to Kenya and South Africa to oversee the process, he was not authorised to speak on the matter.